Got a high score accomplishment or speedrun to boast about? Share it here! Last edited by AmidstStorm on Fri Aug 24, 2018 7:48 am, edited 706 times in total. Last edited by AmidstStorm on Wed Aug 08, 2018 1:10 pm, edited 228 times in total. - We choose one game to play. - The length of each game period will be 15 days. *The only exception being during the Double Header Bonus Round (see section 10). - There will be 10 consecutive games played that will make up one season. - Emulation is allowed and all games must be available to all involved. Save states are classed as foul play in a high score run submission. Practice techniques are down to the player's choice/preference. - The use of auto-fire is allowed on most games. Some games it will not be allowed due to it's enhancement of the scoring. This should be bought up for discussion pregame if any player(s) feels the need. - Games being played across multiple formats, ie. Saturn, PS1 versions, should play similarly, but not in all cases and may have different scoring issues. If players bring it to attention that they have noticed a difference between ports then we will select one. Pregame discussion and research should cover these issues. - In the event of using any type of MAME emulator for arcade titles. Please choose the Japanese ROM as default if available. Console emulator ROM region version will be decided after selection of the new game if the scoring is different across region versions. This should all be decided before game start. - You have 1 credit on a default difficulty to record your highest score. In most cases this will be Normal difficulty which is standard default. If a game's default difficulty is set to Easy (console games, eg. Fire Shark), we will then change the difficulty to Normal. - A random number generator will be used to pick the nominators for the next game (Season 8 addition). Those five lucky players will then each nominate a new game to play for the next 15 days. This is done via PM only to league admin. This will give a selection of 5 new games for all previous game score submitting players to choose from. - No games that have been played in the previous three seasons are eligible for nomination, though previously nominated but non-played games are. This new addition means we can re-visit older games that were played in the earlier seasons and perhaps missed by newer league players. - No games that have a prequel or sequel can be played in the same season, but can be nominated for next season. Eg. R-Type, Sonic Wings series.. (Spiritual sequels for eg. Ikaruga being played in the same season as Radiant Silvergun would be acceptable). - Players should take a little consideration for others when nominating games, eg. easily emulated and available to all involved. Please keep this in mind when nominating. Sadly this closes the doors on some great modern games. Eg. Darius Burst..
- The game is decided by players casting votes. - Voting period is 3 days from when the game is announced (season 8 addition). - The players who have submitted scores for the last game in play are the only ones eligible to cast votes. *Exceptions are preseason only (see section 7). - All players get 2 votes each to cast on any 2 of the 5 games nominated. - The 2 votes can be used on any of the nominated games or both votes can be cast on the same game (season #2 addition) if the player feels that strongly about playing a particular game or dislikes the others for example. - All votes are to be cast publicly in the league thread. You can post votes in the following ways: via our Facebook page, pm, email, text message or other relevant method, but they will be announced publicly by league admin in the league thread. *Only exception being preseason for game #1 (see section 8). - Highest voted game becomes the new game we play. In the case of a tie of votes, a re-vote on the tied games will be asked by all players to pick one of the two. - There will be a short period, a minimum of 5 days between each game played, to give players the chance to decide their nominations and cast their votes for the new game. This includes re-voting periods. All deadlines will be announced prior to nomination/voting period. - The next game will start immediately at 00:00am UK GMT, the following day if all nominations/votes have been taken before the three day deadline. - If the three day deadline has been reached and not all votes have been received, the game with the most votes at that point will be played. If there is a tie of votes, administrative stance will take place and a game will be chosen that will be best suited to the league (ie. better for a scoring competition). A total of 198 points can be had during a season for one player. That total involves placing 1st in rankings on all 10 league games. 1st in the rankings for the double header bonus game (*see below), and 1 credit clearing all 11 games that in total are played. -If 2 players total league points are equal. The player with more ranking points takes the higher place in the table. -If 2 players have equal ranking points and total points. The player who has the higher number of bonus points takes the higher place in the table. -If 2 players have equal ranking points, total points and bonus points. The player who has played the most games takes the higher place in the table. -If 2 players have equal ranking points, total points, bonus points and have played the same number of games. The player who was previously in a higher league position will hold it. - An additional 3 bonus points will be given to any player (whatever position they finish at the end of current game period, even if outside the top 15 high scorers), that manages a 1 credit clear (1CC). - Once a player submits a 1CC score, all future submissions for that game will not effect their bonus even if the future higher scoring submissions are not 1CC's. - Game's #1 & #10 of any season is where the standard nomination period isn't used. - All previous season players get a chance to nominate a new game for the start of the new season (new rule Season 8)By PM only. - All previous season players are PM'd the nomination results. - The results are secret until the new season goes live. - No nominations. The top 5 most voted for runner up games from throughout the season (games 1-9) are announced. - All players who submitted a score for game #9 are eligible for voting in the standard way. - During pre-season a random number generator will be used to pick a number between 1 & 10. This will relate to the number of game in the season which the Double Header bonus round will take place on. This information will be noted by admin, but kept secret and announced at the relevant time. - The top 2 most voted for games of that nomination period will be played simultaneously. - Game time will be extended to a period of 20 days instead of the standard 15. - Double bonus points will be up for grabs if both games are cleared in the time. - Double ranking points also up for grabs. - A player submits their scores in the same way. You can submit as much as you want for either game. If a player chooses to focus on just one game, then that is the player's choice. - Two separate ranking tables will be kept for the double header games but 15 ranking points and 3 bonus points are up for grabs on both games. Eg. If you place 2nd in one game and 5th in the other, your total ranking points will be 14 (2nd place) + 11 (5th place) = 25 points. It's possible to snag a total of 36 points for this one round of the league. 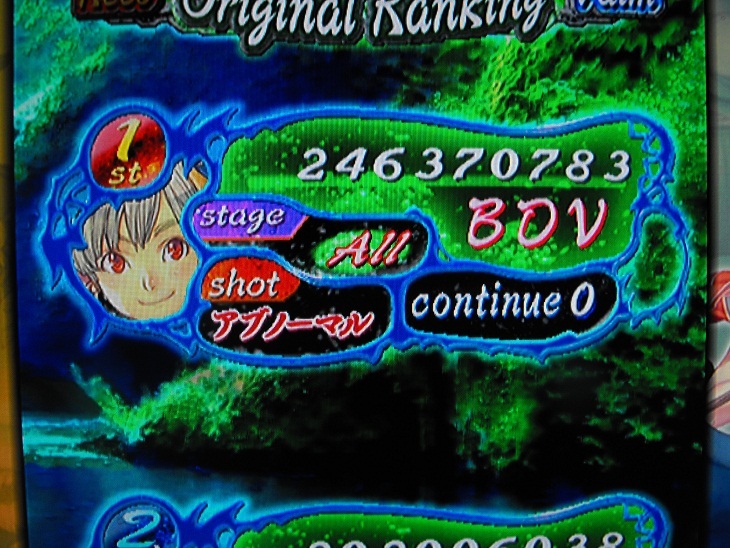 - A one credit clear (1CC) is when a game is completed without the use of any continues. In the shmup world this covers a first loop clear (1LP), not to be confused with a one life clear (1LC). - A loop is when a game is completed but it's stages are repeated, but usually with ramped up difficulty. The scoreboard keeps ticking over. Eg. Gradius has multiple loops. - A one life clear (1LC) is when a game is completed without dying once. - Checkpoints on/off is stated for games where when you die you are returned to the start of the stage, eg. Super R-Type, or to a previous point in the stage, eg. Gradius. - All high score submissions to be valid must be submitted with a photograph or screenshot and posted in this thread or on Facebook for all to see. Please keep all scores to the one available thread on Facebook for ease of admin. - Not every score you post needs a screenshot but come end of game time, there must be a one submitted for your highest score to be valid. If no screenshot is submitted, the score will be deleted or rolled back to your last submission that had a screenshot if applicable. - Please see post 2 on page 1 of the Retro Gamer Forum thread for current submission details needed as these may change from game to game. Eg. of submission info needed. - Only scores achieved during the 15 day period to be posted for submission into the league. - You can submit as many high scores as you like throughout the 15 day period of the current game. - No scores will be accepted after deadline of the date stated for the current game. - All deadline times are in UK GMT. - Just post a high score in this thread for the current game in play, or post a comment and get involved. - You CAN join the league even if you don't play all games, or come in late. Last edited by AmidstStorm on Mon Aug 21, 2017 11:21 am, edited 51 times in total. Being a retro forum, is this going to be any retro shooters or will be be just Cave games? Ok guys this is just a rough outline for now. Any suggestions, ideas, post away. I would say all rule decisions are final at the start of the league, which is 15 days away, so we have plenty of time to iron out everything. Get everyone you know who might be possibly interested in this to come take a look and have their say, and if you want to start playing/posting scores already, I say go for it! nakamura wrote: Being a retro forum, is this going to be any retro shooters or will be be just Cave games? completely down to everyone involved. Mushihimesama was the game that came up first in the 360 thread by the people interested at the time. Nothing is final if people want to play something else. Ok, well personally I would like more 16bit shooters if they are allowed to be accessed by emulator. And the league scoring system is a bit flawed I think. If someone ends up say 200,000 points in front from one shooter but the next shooter has a much smaller scoring scale then there will be little to no way to catch up. Perhaps a simple scoring system might help like a top ten scores for the game score points. nakamura wrote: Ok, well personally I would like more 16bit shooters if they are allowed to be accessed by emulator. I agree, the scoring bit isnt gonna work, when I think about it. Something like Futari, for instance. If we were to have chosen god mode, as an example, I would, one way or another, probably have about 1.2 billion points at the end of that month. If we then were to choose, say.... Galaga.... well, ahh, suffice it to say nobody's hitting a billion in that, the scoring is WAY too different. Or something like Deathsmiles 2, I think I already posted a score in the high-scores thread for that of like, what, 5 squillionty? Alot of recent titles are high-scoring games.... alot of retro titles.... and I DEFINITELY agree with Nakamura that we should totally do some retro games too.... are definitely low-scoring. Hell, something like Space Invaders, getting like 300 points or whatever from a UFO is a pretty good chunk of points. Not sure HOW this'd work out best, but.... sure something can be thought up that'll work out nicely. Very true on the scoring. Especially if we jump from a Cave shmup to a game like Gynoug. Perhaps a simple 10 points for 1st place etc? I'm all for any shooters personally across any format. My only quarm with emulation is that people could use save states and i'm not saying people would, but there's always that possibility. This is literally an outline for a league. That's why I wanted to give a good amount of time before start to iron out all the flaws and let any interested have their say. ok, point system scrapped from main post. Here's a score from me to start with, if nobody minds me popping one up there now. Was getting irritated at Ketsui, so the suggestion of doing Futari instead today made perfect sense, lol. Not the most interesting scoring system ever, but this mode is still a blast. I'll probably keep at it for awhile and see if I cant do better than that. My god mode score is alot better, comparatively. I've not beaten that mode yet. That mode is an absolute blast, but.... screw the second half of stage three, and that blasted spider. Even playing Futari Original today.... I got all excited at one point where it's like "Heeeeeyyyy, I got through stage 3 and to the boss WITHOUT having a random death in the second half! Pretty great!" and then the stupid spider appears, fight starts, I *immediately* get hit. Or another run, I actually did defeat the blasted thing without dying/bombing..... felt pretty good about that, went into stage four, shot the first group of foes, and then..... ran into a BUTTERFLY and died. A damn butterfly! Tiny little things that spawn for whatever screwball reason from those really big flying dudes that appear in that stage. Talk about a buzzkill there. And yeah, I'll get a video up probably soon-ish here. I was gonna do one today, but Youtube has been an absolute toad all day. Well, techically could be my modem acting up, but.... Youtube being buggy as heck and all, I tend to just blame them. I have alot of shmup videos UP though. Just not of this run. Here's a couple for the heck of it if you care to see. and yes, I know the 2nd video's name got screwed up, I was too lazy to change it, lol. Feel free to look at other stuff I put up, but be warned that it's..... very disorganized. I'm lazy and didnt make playlists, so there's shmup runs all jumbled together with LP stuff and random whatsits. EDIT: Actually, no. Those are good, but.... I'll have a much, much better video of this game up tomorrow. Decided to try a certain something in the game, and..... well, I cant believe I actually got it on video. Or that I actually DID any of it. And now my hands are shaking too much from that to keep typing much. Yeah, I'll post that video in here somewhere, possibly in the other thread, when it's up and working. ...."holyfreakingcrap" pretty much describes what just happened. I can try and beat it? Not a fan of Cave shmups, so I'll probably jump in with the next game.